The first appearance of the mysterious Lili Elbe occurs at a public social in the Danish suburbs, where locals have turned out to engage one another in sumptuous discussions about art. Her friend, the talented Gerda (Alicia Vikander), is attempting to break into this medium, but is facing a steep challenge: she paints human portraits, and such material is seen as blatantly ordinary for potential investors. As she passes through the scene in a gentle sweep of charismatic involvement, men stare at Lili like sharks circling a fresh catch. No one has seen her before, and it is scarcely a wonder as to why they are so enraptured: aside from being extremely beautiful, she is also incredibly shy and nervous, which seems to add fuel to their burning passions. It never dawns on them that the woman they are gazing at with lustful insinuation is actually a man, a well-known landscape artist rising quickly to the peak of his potential just as he begins questioning the nature of his own identity. Do they quietly know the reality, or are they looking only through the lenses of false pragmatism? And when a handsome stranger (Ben Whishaw) offers to whisk her into a private setting for an opportunity to get to know her, is his intrusive dialogue an admission of comprehension, or is he oblivious to the truth? 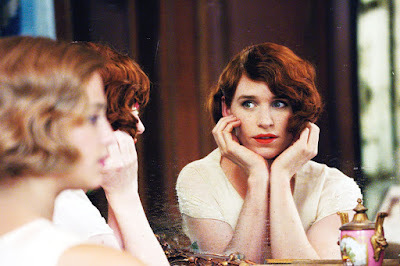 In most plots the presence of Lili would be a mere device to propel certain twists (many of them frivolous), but “The Danish Girl” sees something deeper than an image: it senses the identity of someone who exists beyond the physical manifestation, a lovely creature who has been trapped inside a body that does not represent its very soul. Who is she but a silent wonder beginning to emerge, and is her avatar, the talented Einar (Eddie Redmayne), ready to deal with the inevitable ramifications of embracing her spirit? It is a silent virtue of recent stories about transgendered characters that filmmakers are seeing them from a different light beyond comedic escapism, and here is a movie that contains the most heartbreaking rendition yet. This isn’t a study of alternate lifestyles or even the base psychology of gender identity, but a simple and moving story about how one man felt something hidden underneath, and put everything on the line to the woman within him free from the clutches of secrecy. The movie is a retooled adaptation of famous source material, about a man who became a woman in the 1920s when social acceptance was a thing of fantasy, and medical capabilities offered impossible odds for success. Some, perhaps, may not even be aware that such an event was even feasible, but it is one of the unspoken virtues of cinema to discover the lost truths of the human condition. The movie begins with innocent framework: a married couple (Redmayne and Vikander) are gradually building a reputation in Denmark social circles for their shared loved of the painted canvas, but only Einar finds some level of success; his paintings of landscapes are embraced for their striking flair, while hers – portraits of figures – are sneered at (even when her husband attempts to influence gallery dealers). Their chemistry flows with the natural docility of animal companions, but there are playful exchanges that suggest underlying naivety. Then, when Gerda asks Einar to pose in place of a female model so she can complete a painting about a ballet dancer, his contact with the garments seems to light an emotional switch in him that drives a new degree of personal enthusiasm. Gerda picks up on this prospect, and indulges him. One night, when Einar expresses no interest in attending a social function, she suggests dressing him up in makeup and women’s clothing to attend as someone else – not necessarily as anything more than just light-hearted masquerade. She paints portraits of him dressed as Lili, and a local art dealer sees great potential in them; the model is just as much a discovery as the work itself. There is humor in her approach, and a close girlfriend feeds the energy with jovial laughter. But Einar, cautious in the portrayal, has eyes that blend curiosity and amusement with certain liberation, as if something inside had just been brought out of internal exile. Was there an Einar at all, or was he just a projection on the outside to hide unspoken feelings – namely that he always felt he was a woman, and was not born with the body that would allow him to live by those gestures? His personal realizations are brought to a crest of swirling emotions during an encounter with a fetching gentleman during a kiss, but there is no time to ponder the joyous implications. Here is a man who is making a discovery just as his own health seems to be waning in rapid intervals, and his wife comes to a quiet realization that this new identity of “Lili” is, perhaps, more than just a name for a silly new alter ego. How harrowing it is to consider just how many opposing directions this premise could have gone. Director Tom Hooper, who rose to filmmaking prestige with “The King’s Speech” and “Les Miserables,” tackles the concept at its source without relegating it to all of the prototypical mandates of a film about relevant social causes. That’s because he and his writer Lucinda Coxon do not see Lili as an instrument of social awareness; they regard her from a place of passionate investigation, and are content to stand back far enough to allow their actors to deal with the material from the suitable channels. It is inevitable for the story to follow a road of events in which Einar must pursue all possible avenues in becoming a full woman – and all while the arguments between he and his wife are fueled by frustration and limited understanding – but they are not burdened by the contrasts of cultural restrictions. So much of this film could have fallen in the space of melodramatic excess – especially if it had spent much of its time on the persecution angle – but like an outcast driven only by unwavering goals, it forages on with few side glances, even as it becomes obvious that the minor characters are all part of a system that must see Lili’s crisis as nothing more than insane ramblings. Much will be said about the complexity of Redmayne’s portrayal of the title character – and rightfully so – but it is young Alicia Vikander as Gerda that is the most striking revelation. Her work as a conflicted wife is equal parts struggle, concern and acceptance, and just as long a road as Lili must endure to reach the end result of her most aching desire, Gerda’s runs parallel. There is a silent struggle going on within that she at first does not comprehend, but unconditional love lights the way for her to become the guiding force her mate so desperately needs. It is hard for her to understand what he is going through, but does not let the stamped answers of her time blind the actuality of the situation ahead, even though it means painful changes to her own existence. That is a brave impulse given the era in which these two reside, and Vikander is convincing at supplying all of the needed emotional pull in a journey that is littered with impenetrable obstacles, all while not reducing the portrayal to soundbites or overzealous scene chewing. Where this must go is inevitably tragic. Lili is a soul born in the wrong time and place, and her dreams are chained by the limitations of attitudes, science and cultural perceptions. But seldom has such an unquestioned destiny in a film filled us with such uncompromising hope, or been so unafraid to stare back at those dealing with such incredible pain and suffering. “The Danish Girl” is as relevant right now as it is moving, but no one involved wants to prop up the details just for the sake of advancing a cause (although that is a respectable motive either way). Moreso than anything, it is a love letter to life in all forms: physical, emotional, even cerebral. It desires to leave us with fulfillment, a feeling that the struggles of people like Lili are not in vein but in celebration of who we are to one another regardless of race, sexual orientation or gender identity. The last scene, a beautiful culmination of those merits, is as striking artistically as it is narratively, and in that moment of realization there is no doubt that what we have just seen is a sweeping embrace of our collective humanity. This is one of the best films of the year, and certainly one of the most cautious and compassionate I’ve seen about the issues it raises.